The paper deals with conformity of exogenous processes monitoring data obtained from different sources. To provide sharing data with different accuracy and measurement error, an algorithm for its conformity is present-ed. The algorithm involves bringing data to a single measurement unit. Data with varying accuracy is brought to single accuracy and order. Accuracy is determined by taking into account the measurement interval. For con-formal processing data, having different error, a three-item combination of «value, accuracy, measuring inter-val» is applied. Error value can significantly change the measurement data. For this reason, when calculating the trend lines (process dynamics) from various sources data, it is necessary to perform the estimation based on the three values rather than on a specific value. Keywords: exogenous processes, monitoring, data, data processing, error, matching. Sharapov R.V.The transition from the technical to the natural-technical systems // Engineering industry and life safety, 2012, № 2. – P.43-46. Sharapov R.V.Indicators for monitoring and assessment of karst processes // Engineering industry and life safety, 2013, № 1. – P.28-34. Sharapov R.V.On the conformity of monitoring data obtained from various sources// Engineering industry and life safety, 2013, № 4. – P.43-46. Sharapov R.V.Some problems of exogenous processes monitoring // Fundamental research, 2013, № 1-2. –P. 444-447. 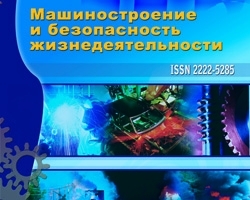 SharapovR.V., Sharapova E.V.The problem of integration of digital collections of the state of ecosystems // Engineering industry and life safety,2009, № 6. – P.75-78. Sharapov R.V. Determination of karst collapse intensity from incomplete data // Engineering industry and life safety, 2013, № 2. – P.36-40. Conformity algorithm for exogenous processes monitoring data, №4 (18) 2013, Sharapov R.V.